It is a bit ironic that we try so hard to preserve shrimp and make them happy with the end goal being to thread a hook through their head and wait for them to get crushed by a fish. But ultimately what we as anglers want are some big fish, and shrimp are the most effectively consistent live bait for fish. So here are tips to keep your shrimp alive and kicking as long as possible. 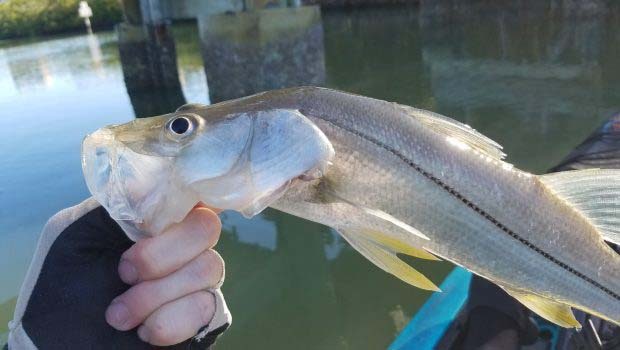 You never know, that extra twitch could entice a big snook! The number one reason that shrimp die is due to heat and the complications warmer water causes. As the water heats up the oxygen depletes more rapidly because the warm water can’t hold as much dissolved oxygen. Also the warmer water allows toxic compounds dissolve more rapidly such as ammonia and other chemicals found in bug sprays and sunscreen. Adding zip loc bag of ice or a frozen water bottle to your live well or bait bucket can help cool down the water and the shrimp’s metabolism so they last longer, however be sure not to shock them with the sudden temperature change. Also tap water and most bottled water contain chlorine which will kill shrimp quickly so don’t just add ice into the bucket and let it melt, make sure it is in some sort of closed container. Melted ice also would change the salinity of the water which is not good. It also goes without saying that keeping shrimp out of the sun and in a shady cool area will help quite a bit. Shrimp, like any other fish, go to the bathroom in the water. Their waste creates ammonia in the water which isn’t an issue in the open ocean, but can lead to a quicker death in an enclosed bucket. This is the reason that aquariums have filtration systems to remove waste and keep fish healthy. The best option to get rid of ammonia in your bait bucket is to do regular water changes and add flow to constantly circulate the water. This will help remove the bad ammonia and replace it with clean water, however keep in mind that if you’re also using ice to keep the shrimp cool you’ll have to do this just a bit at a time. Also avoid pumping water into your live well or bucket until you’re out of the marina because the water in that area is usually contaminated with gas and oil which shrimp are very sensitive to. Replacing the water will also refresh the available oxygen which we will talk about next. Shrimp need oxygen in the water so they can breathe, otherwise they will suffocate. The more shrimp you have the more oxygen you need. A good rule of thumb is about a dozen shrimp per gallon of water. Using a portable aerator or bubbler works great for adding extra oxygen into the water and disturbing the surface. There are lots of options on the market that will run off of batteries if you look around a bit. Also note that cooler water can hold much more dissolved oxygen. That’s why when you buy shrimp from a bait shop the water is always cold and they have PVC pipe with holes spraying water into the huge tank to add oxygen. Add a netting or some type of material in your live well for the shrimp to grab onto. They will last longer if they can grip on a surface rather than having to swim the whole time as the water sloshes around your tank. Swimming with nothing to grab tires them out and makes them have to work harder. The goal is relaxed shrimp that aren’t kicking until you put them on a hook. Shrimp are sensitive to changes and adjusting the water salinity quickly will cause them to get stressed. It’s hard to know what the salt content of the tank at your bait shop is, so if you’re not able to net shrimp fresh from in the water where you’re fishing, and most of us are not, then try to slowly even out the bucket or live well water with new water so you don’t shock them all at once. This goes along the same lines as the temperature and water changes. Small amounts over time will keep them alive longer. Grabbing shrimp out of a bucket with your hands is the quick and easy way to go, but most likely you have sunscreen and bug spray all over your hands. This will contaminate the water and cause the shrimp to die quickly since it is toxic to them. Not to mention that chasing shrimp around with your hands stresses them out and knocks them all around. Instead use a dip net to quickly get a shrimp. I also use my dip net as a material for shrimp to cling to since it fits perfectly in my bucket and doesn’t move around. All the tips up to this have been to keep shrimp alive until they’re ready to use, this one is to make them last longer on the hook. The number one tip here is to use a lighter hook. Shrimp can’t be as active if they are hauling around a massive hook, and fish are likely to see a big hook anyway. Instead opt for something small and light like a mutu light circle hook, maybe size 1/0 or 2/0. This should be large enough hook most fish but light enough to give your shrimp some extra life. One final tip that I think makes a difference is paying the premium for larger shrimp. A lot of bait shops don’t like to hand pick shrimp and will give you the go around about it taking extra time and not being worth the cost. But I’ve found that offering them a few extra bucks can get you some larger shrimp from all but the grumpiest of the old salts running the shop. 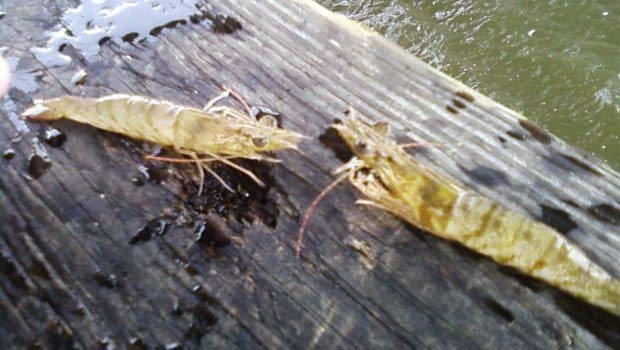 Large shrimp are more noticeable in the water, typically attract larger fish, and they are more hardy than small ones. I always notice that the smaller shrimp die first and I think it’s because larger shrimp are stronger and have more of a tolerance to environment changes. Give these tips a try and you will be guaranteed some more lively shrimp that will catch fish!